Nikon offers three series of spotting scopes including the top end EDG series, the mid-range Monarch series, and the ProStaff group for the more budget conscious. Each series has both angled and straight configurations in 60/65mm and 80/82mm objective sizes. 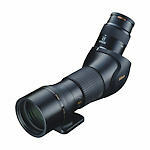 Nikon Monarch Fieldscopes are available in 16-48x60 and 20-60x82 sizes in either angled or straight models. All have ED glass and Field Flattener Eyepieces. Fieldscope ED50 spotting scopes are Nikon's very popular compact scopes. Made with ED glass, waterproof/fogproof, and just over a pound, the 50ED Fieldscope is a perfect scope to pair with a monopod in the back country. Available in angled and straight bodies, 50ED Fieldscopes are fully digiscoping-adaptable using Nikon's brackets and adapters. Nikon ProStaff 3 spotting scopes are 16-48x60 zoom scopes. 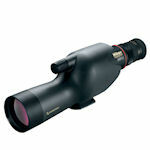 ProStaff 3 scopes were replaced by ProStaff 5 spotting scopes but some models still available. These bargains won't last long. 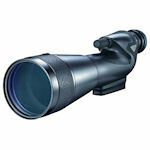 Nikon ProStaff 5 spotting scopes feature excellent optics for the birder on a budget. Lightweight, nitrogen-purged and waterproof, ProStaff 5 scopes offer a good field of view and comfortable eye relief. ProStaff 5 scopes are available in straight or angled body models with 60- or 80-mm objective lenses; all Outfits have straight bodies.